A vigil in support of Michael Brown occurs outside of the Ferguson Police Department. Ferguson police have been criticized for what some have called an overly miliarized response. The city of Ferguson, Missouri anxiously awaits a Grand Jury verdict for the officer involved in shooting Michael Brown, an unarmed black teenager. The incident has sparked widespread public outrage and conversation, culminating in a string of protests and demonstrations nationwide, some which turned violent. Another source of contention has been police response itself – particularly in Ferguson, where police were criticized for being overly aggressive and overly armed. Today, news outlets are reporting that St. Louis county police have spent $100,000 on riot gear, Governor Jay Nixon has put the National Guard on standby, and gun store owners say sales are up nearly 300 percent. But are all these preparations for violence creating the expectation it will occur? Texas Standard's David Brown speaks with Scott Bowman, associate professor of Criminal Justice at Texas State University, about what could potentially fuel public unrest. “I believe in a lot of ways it creates a self-fulfilling prophecy,” Bowman says. He says similar incidents of civil unrest can show what happens when tensions are already high – and for so long. 'It just takes something small to spark something that much larger," Bowman says. "If you put that many people in that space on edge, it may not take much to get something started." 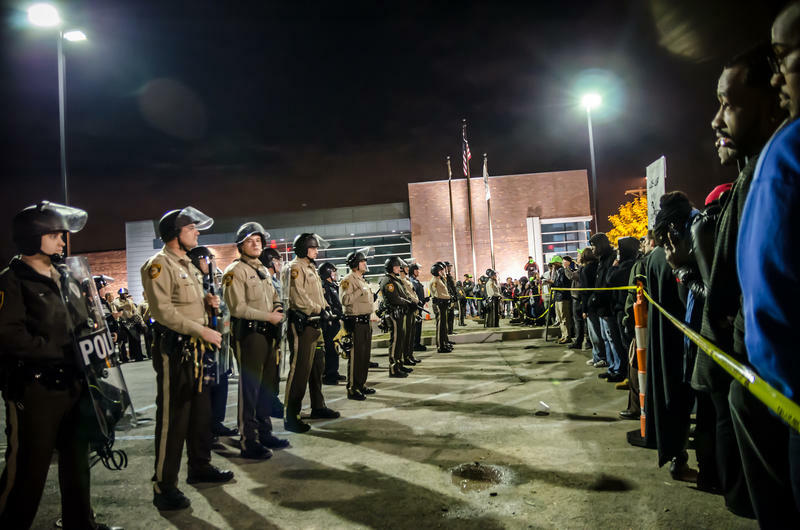 The Ferguson Police Department has already been under a great deal of scrutiny. CNN reports that since the shooting death of Michael Brown, three officers have resigned, retired, or been fired due to questionable actions. The department's response to anticipated protests will be under close scrutiny. "The people are already there and are already in the streets. The question really is – what can you expect?" Bowman says. "I think that becomes the challenge for police officers …the difficulty of planning to maybe reinstate militarized policing in the community they work in." Production assistant Alain Stephens contributed to this post. An MP3 version of the above story.